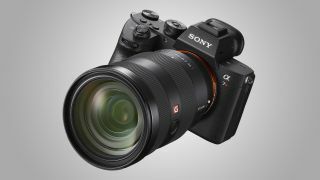 The Sony Alpha A7R III is the company's latest mirrorless megapixel monster, replacing the Alpha A7R II, and if the specs are anything to go by, it's sure to be a hit with photographers. The new Alpha A7R III might still have the same 42.4MP resolution, but a lot's changed, with notable boosts in performance across the board. Let's take a look. At the heart of the A7R III is a 42.2MP back-illuminated full-frame Exmor R CMOS sensor, but Sony's coupled that with a new front-end LSI that almost doubles readout speed of the sensor. As well as this, the A7R III has also been equipped with a new BIONZ X image processing engine, which with the new front-end LSI boosts processing speeds by up to 1.8 times compared to its predecessor. While the A7R III's sensitivity range remains unchanged (ISO50-102,400 at the camera's expanded setting), Sony claims the new camera will have a 15-stop dynamic range at low sensitivity settings. The overhauled image processing system means the Alpha A7R III doubles the burst shooting speed of the A7R II, shooting at 10fps with continuous AF/AE tracking for up to 76 JPEG/raw images or 28 uncompressed 14-bit raw images. This is possible using either the camera's mechanical shutter or if completely silent shooting is needed, with the camera's electronic shutter. If you're going to be rattling off a large burst of images, many of the A7R III's key functions are still operable while data is written to the card. The focusing system of the Alpha A7R III is also upgraded. The 399 focal-plane phase-detection AF points stays the same, but there are now 425 contrast-detection AF points - a huge increase of 400 points compared to the A7R II. This revised system should deliver much quicker AF acquisition in low light conditions, while tracking performance is said to be twice as accurate as before. The Alpha A7R III is equipped with Sony's 5-axis optical image stabilization system, but that has been tweaked to deliver a 5.5 stop shutter speed advantage, improving on the A7R II's 4.5 stop system. To reduce the risk of vibration and image blur, there's a new low-vibration shutter. While there's no XQD card slot on the Alpha A7R III, one of the dual SD card slots supports UHS-II type SD memory cards. Battery life has also been improved, with the new camera using Sony's Z series battery that should see capacity increase 2.2 times that of the W series used in the A7R II. The Alpha A7R III gets the same electronic viewfinder (EVF) as the Alpha A9, with the Quad-VGA OLED EVF sporting a resolution of approximately 3,686k dots, while also utilizing a Zeiss T* Coating to reduce reflections. On top of this, the A7R III supports a customizable frame rate for the EVF, with options of either 50fps or 100fps. Along with the EVF, the rear display has also been upgraded, now with a resolution of 1.44-million dots, though there doesn't appear to be any touchscreen functionality as we've seen with other recent Sony announcements. Just as we've seen with the Alpha A9, the A7R III offers a multi-selector joystick for quicker AF point selection, while there's also a dedicated AF-ON button for back-button focusing. The Alpha A7R III offers 4K (3840 x 2160 pixels) video capture with the full width of the full-frame image sensor. When shooting in the A7R III's Super 35mm format, the camera uses full pixel readout without pixel binning to collect 5K of information, oversampling it to produce high quality 4K footage with exceptional detail and depth. The Alpha A7R III features a new HLG (Hybrid Log-Gamma) that supports an Instant HDR workflow, allowing HDR (HLG) compatible TV’s to playback 4K HDR imagery, while both S-Log2 and S-Log3 are also available. The arrival of the A7R III also sees the launch of a new software suite called Imaging Edge that's designed to assist the entire shooting process – from pre-processing to post-processing. There are three PC applications called ‘Remote’, ‘Viewer’ and ‘Edit’, available for free download, which support live-view PC remote shooting and raw development. Finally, the Alpha A7R III gets a new Pixel Shift Multi Shooting mode, designed to create super-high resolution composite images. In this mode, the camera precisely shifts the sensor in 1-pixel increments to capture four separate pixel-shifted images containing a total of approximately 169.6MP of image data. These four images can be composited together and processed utilizing the new Imaging Edge software suite to produce an ultra high-resolution image. The Sony Alpha A7R III will begin shipping in November, priced at approximately £3,200/$3,199/AU$4,999.